The Parallel Plate Clarifier is an inclined pate, shallow depth sedimentation device. In comparison, the Parallel Plate Clarifier has a number of advantages which overcome the limitations of other products designed for the same performance applications, advantages which yield savings in space requirements, capital, and operating costs. In addition, the technology is key to enhanced solids removals in the liquid/solid gravity separation systems. These wastewater clarifiers are manufactured in various materials of construction, depending upon the requirements of a Parallel plate clarifiers have been used in specific applications for precipitation for many years. This design allows for a higher rate of flow in a smaller footprint. In addition, the parallel plate clarifier design is simple to operate and has a considerably less expensive maintenance cost because there are few, if any, moving parts; perfect for new decentralized wastewater systems. 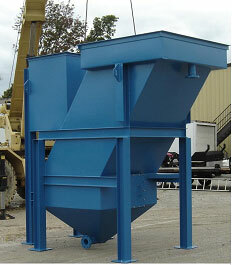 The parallel plate clarifier will provide for separation of free settling, non-hindered solids in wastewater. Wastewater will enter the influent distribution chamber where the influent diffuser header and the flow distribution orifices will provide for the appropriate flow dissipation and distribution before entering the adjacent parallel plate packs and the solids collection chamber below. The inclined parallel plate packs will provide for removal of free settling, non-hindered concentrations of solids from the influent wastewater. Whether using a parallel plate or circular mechanical wastewater clarifier system, or a combination of other waste water treatment plants and/or systems, let PCS design and build the perfect wastewater treatment solution for you.